1) Those who like to rock denim on denim. 2) Those who would NEVER EVEN CONSIDER pairing denims together and giving all of us that do MAJOR SIDE EYE. I happen to fall in the first camp. 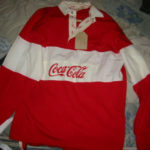 I WEAR IT AND LOVE IT. Until a little over a year ago I was definitely on the “side eye” side of the street. 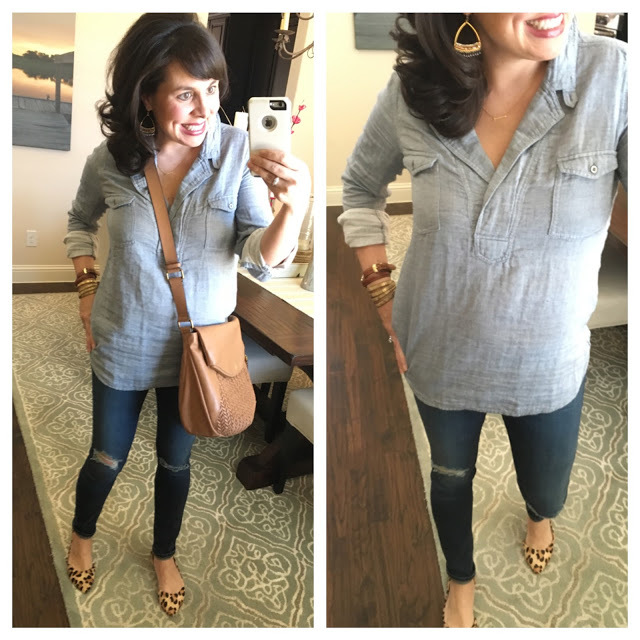 I started seeing denim on denim (done really well!) all over Pinterest and in magazines, so I decided to give it a whirl. 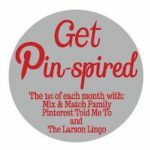 I felt like it upped my cool factor – and this mama needs all the help I can get! If you need a little inspiration (and convincing) before seeing my outfits today, check out my Denim on Denim Pinterest Board HERE. There’s really only 1 rule that I think about when doing the denim on denim thing, and it’s a rule that all the ladies in the Pinterest board seemed to follow as well. After that, the outfit can be easily dressed up (ex. with heels and gold jewelry) or dressed down (ex. with converse and limited jewelry). All different types of shoes and accessories can be used for styling the denim outfit! 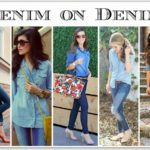 So, I have a handful of denim on denim looks for you today! For the first outfit, I took inspiration from the pic on my Pinterest board with the leopard flats! I know all of you already have a pair of jeans, many of you already have a chambray shirt, and lots of you have leopard flats! This is an outfit many of you could probably pull of today if you wanted to! AND YOU TOTALLY SHOULD! BE BRAVE, LADIES! All of the pieces I’m wearing are still currently available! Let’s talk about the shirt for a minute. It’s from Lou and Grey, and I have it in THIS plaid and THIS simple chambray. I’ve already worn it with black pants, regular ol’ blue jeans, and I’ll definitely be pairing it with white jeans and khaki shorts as well! It’s soft, relaxed, and I love that it’s a popover with an interesting collar. And the length and fit doesn’t make me feel like I need to tuck it in or even do a 1/2 tuck (although I have worn it with a 1/2 tuck on a couple of different occasions already). For size reference, I’m wearing a small, so I think it’s true to size. Get The Look For Outfit #1 Here. Just click on what you are interested in! 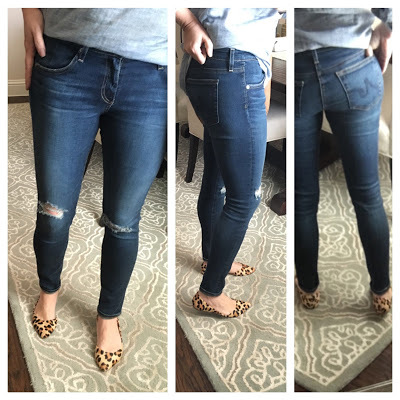 So if you remember, last year I did a post with Nordstrom on designer jeans. I tried on a ton from Paige, Hudson, Seven for all Mankind, Joe’s, and the list goes on. These AG skinny ankle jeans were a clear winner for me. You can find my exact pair HERE, but all of the AG skinny jeans are HERE (with lots of different washes and varying levels of distressing). They are definitely pricey, and believe you me, I might have had a heart palpitation or two when I bought them…..but now I believe in the power of a designer jean. I’m not a jeans snob at all (I still love and constantly wear my Vigoss all the time and my Wit and Wisdom here and there), but THESE AG’s are the bomb. For size reference, I’m wearing a 27, so I think they are true to size. At almost 5’4″ these are the PERFECT ankle length for me. Great for flats, converse, and booties…and also perfect to tuck into tall boots. I wear these jeans all year long. Click HERE for the earrings. Lots of you have inquired if they are heavy, but they aren’t at all! Heavy earrings give me headaches, so I rarely wear them. I love the shape of them because they were different than any earring I already owned, and I think it’s so fun that they mix several different metal colors. available :(, my shoreline converse, and some dainty little wood jewelry (hard to see in the pics, but you definitely need to check it out). And here’s one more standard denim on denim look. 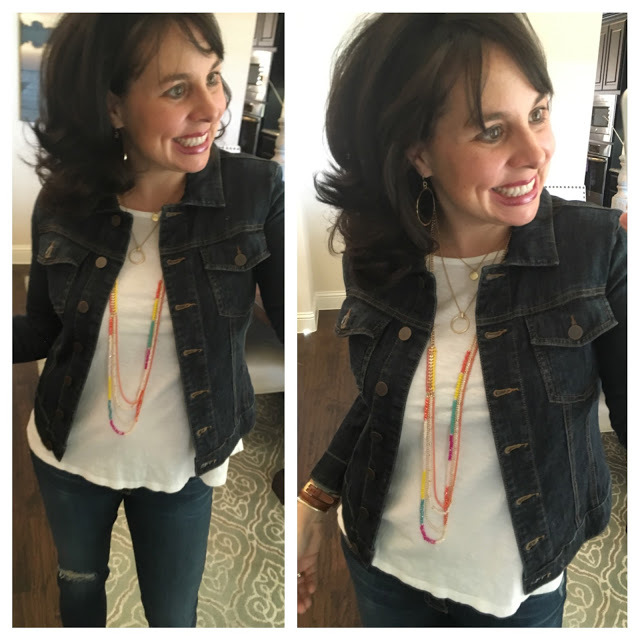 I still went with the lighter on top and darker on bottom rule here, but I paired the outfit with the comfiest flats ever and a colorful necklace to change it up! AND for a WAY less expensive jean, I love these jeans that are sooo comfy I’m calling them “pajama jeans”! For size reference, I’m wearing a small in the top (true to size). I’m wearing a 25 in the jeans, and I’m NOT a 25, so size down 2 full sizes! And here’s a look I showed a couple of weeks ago. And I broke my own denim on denim rule! My jacket is a really dark wash, darker than the jeans, but I still felt like it worked! And here are lots of different wash choices for Kut from the Kloth denim jackets. I’m telling you, if you don’t on a denim jacket, fix that now with one of these! They are soft, not stiff at all, and not boxy. I have the 1st and 2nd jackets and love both of them! So, I’m dying to know! And finally…you might want to check back here tomorrow. I have an announcement that you don’t want to miss! Just got an e-mail that LOFT is 29% OFF of everything today! AND in addition to the sale, you will receive $25 LOFT CASH for every $50 you spend! Denim on Denim. Yeah, I’m Going There. Camo and Denim. It’s like Peanut Butter and Jelly. Kind of. I'm a big side-eyer. I'm not sure why because you made that all look darling but I can't say that I've ever paired denim on denim. Looks like I need to change that ASAP!! Off to choose lots of denim!! 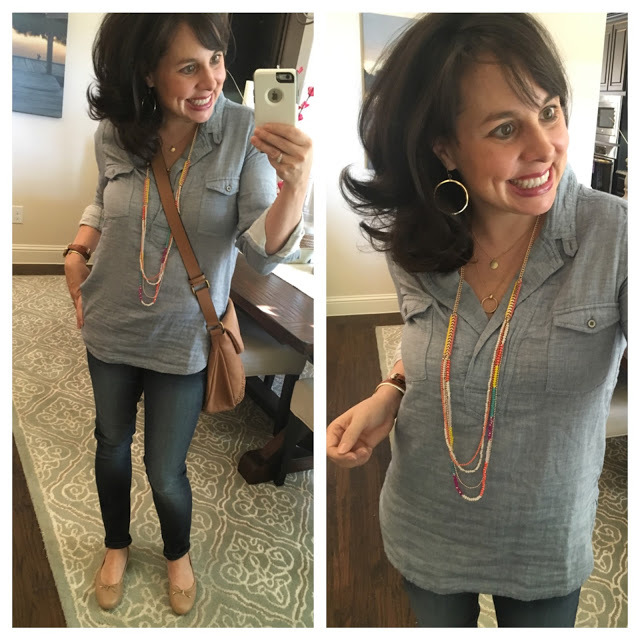 That Lou and Grey chambray top is so cute!! It looks like it is the perfect weight!! I am saying Heck yes!! This is absolutely one of my very favorite combinations!! I love all of your new denim on denim pins too! I have been a firm no to denim on denim. Maybe you can convince me. Never say never right? You are just too cute!!! I have never felt like it looked right on me, but maybe I'll give it a try again! Ok you are convincing me on the AG jeans! I have been eyeing The Farrah which are a little higher cut. The reviews are so GOOD!!! You look adorable in your denim on denim!! 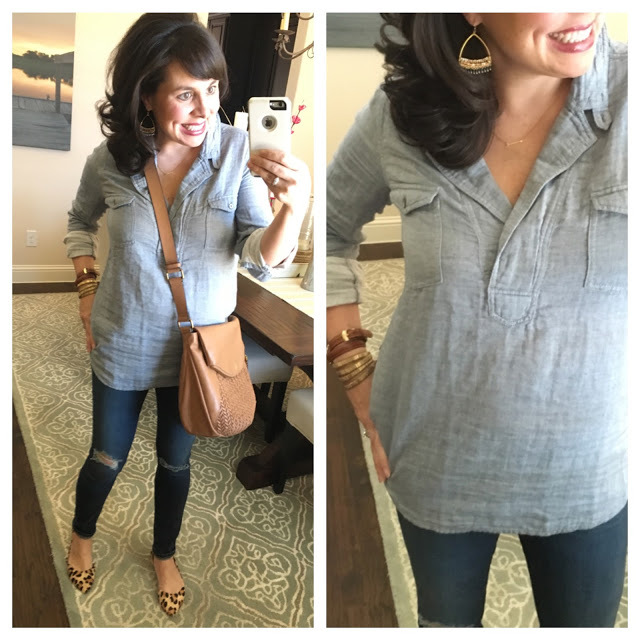 I like the idea but I think I need to invest in a good chambray top!! I love your looks. 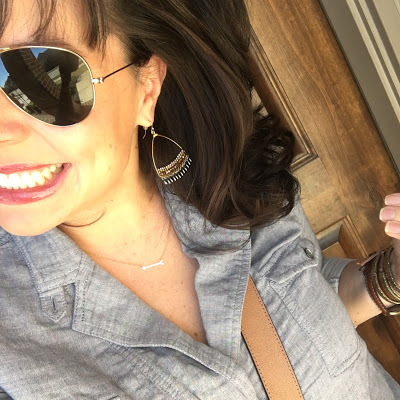 I have been waiting for the jcrew popover to come back in stock, but I found this one at Target last week and LOVE it! It might be a good option for your readers. 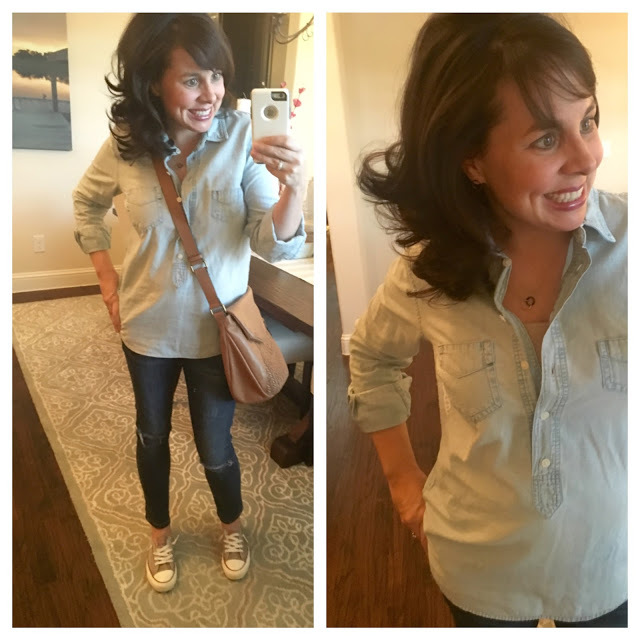 Definitely a heck yes for denim on denim, always have been! I have a pic of me and boys from 1994 where we are all in denim (and really big hair!) Ha! But I must say, the denims now days are way cuter! Oh, HECK NO! But you look cute and I'd never give you the side eye. I dispute your formula 🙂 Is there anything cuter than white jeans and a denim jacket?! Always been worried about sporting the Canadian tuxedo but now after seeing your outfit combos I think it might be worth a try. No side-eye from me….it's darling, and so are you! I was also in the second camp until you told me to, and it looked great! 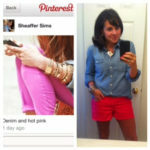 It takes the guesswork out of what to pair with a denim top…Once upon a time it was either khakis or white pants. Thanks to Pinterest and you, I'm wearing denim on denim like a boss. Love denim on denim! Something you need to try is your light popover on top and your dark flare jeans. I do a small front tuck on the shirt and my Tom's booties. It's cute, cute, cute!! Definitely a yes!! I always wonder if its “OK” when I and doing it but love the look!